Celebrate Women's History Month and learn about pioneering Carolina women. This walking tour highlights the history and experiences of women connected to Carolina, as captured in Southern Oral History Program collections. 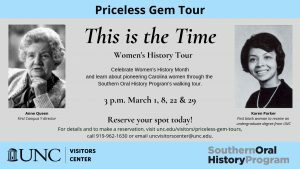 For details and to make a reservation, visit the Priceless Gems Tours page, call 919-962-1630 or email uncvisitorscenter@unc.edu.